When I think of The Botanist the first thing that springs to mind are the cocktails. For me it’s part of the whole experience and the plants (or botanicals) play a big role. I tried the English Mojito and it’s a take on the classic cocktail that brings something of the English summer (often short-lived that summer I know, but in full force the day we visited). A mix of cucumber and mint, fresh lime juice, sugar syrup and a splash of green apple liqueur, lengthened with apple juice – it was really delicious and slightly zingy. My guest had the eponymous, signature cocktail The Botanist: a classic mix of Ketel One Vodka, rum and elderflower liqueur which was very welcome refreshment on a hot day. There’s plenty to choose from on the menu (small point – the menu is in quite a small, light typeface, so if you need reading glasses, be sure to have them with you). I went for the Crispy Calamari with fajita salt, guacamole, toasted sweetcorn and tomato salsa. The key thing with calamari is to cook it right, so it’s not rubbery and that was certainly done well. The other ingredients helped compliment the calamari. 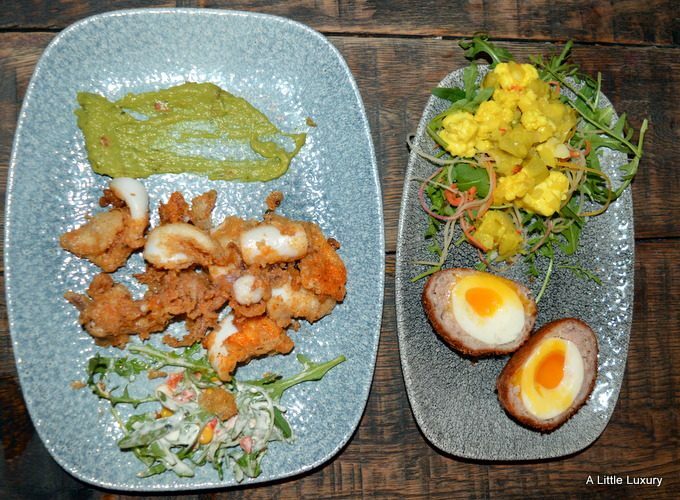 My companion went for the Cumberland Scotch Egg with homemade piccalilli. I sneaked a bit off the plate and can confirm it was very tasty. For my main course I decided to go with the dish that is associated with The Botanist: a hanging kebab. I went for the Salt and Pepper Pork Belly served with properly seasoned chips,sopped with sweet chilli and ginger. For those who haven’t seen these served, you get a little dish of sauce at the top of your hanging kebab holder and this is poured over your kebab to flavour your meat and your chips below. The meat was meltingly tender and very tasty as you’d expect from pork belly. We both had some tangy Buttermilk Coleslaw on the side which gave the meal some extra texture and welcome vegetable element. My fellow diner opted for the Red Tractor-Assured Half Chicken marinated in smoked cajun spices, served with Scotch bonnet hot sauce and properly seasoned chips. The chicken was tasty and had a good level of spice without being over-powering. Roasted Pineapple Pot with raspberry sorbet. I was a little disappointed that the chocolate wasn’t that bitter – I think I was expecting a dark chocolate from the description, but what I was served both looked and tasted like milk chocolate. The raspberry sorbet was absolutely delicious though. My friend went with the Ice Cream Selection and picked out the same raspberry sorbet as one of the options. The ice cream was the perfect dessert on a hot day. The service was prompt and attentive throughout. We had a helpful waitress and we didn’t have to wait long for our drinks or our food. The Botanist was pretty busy so it’s good to know they can provide a good level of service even when there are a lot of people eating and drinking. Towards the end of the meal the live music started which is a great way to end the evening. Very enjoyable meal and drinks – I think we will be back. 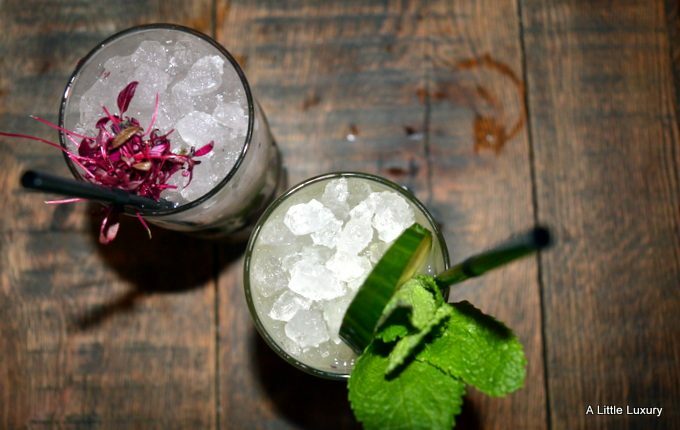 Oh I love the sound of the English Mojito – Elderflower is such a particular taste – very refreshing. I do so love the Botanist too! It’s such a great place to pop in!! The Botanist is great – such fab cocktails. Sounds like you had a great experience there! I must try that English mojito. 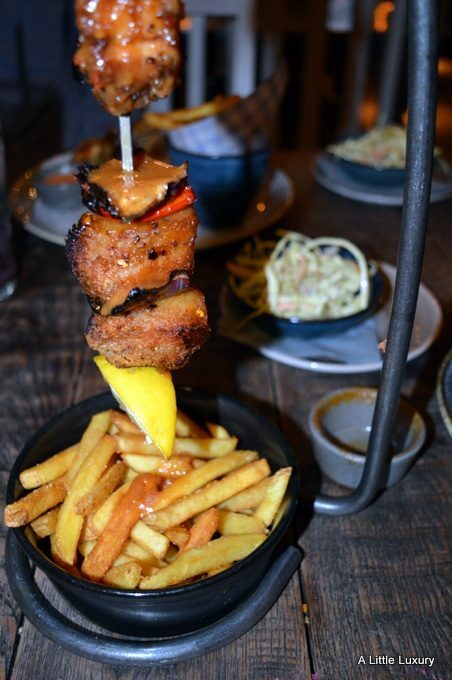 Ooh I haven’t heard of the Botanist but reading your posts whilst I’m starving hungry has not helped me one iota, that food looks amazing!!! Those cocktails do look marvellous. I think calamari is a good test of how good a restaurant is and it’s nice to hear that they cooked it well. I would love to try English Mojito. It sounds very refreshing. I love the sound of the Botanist. It all looks so good I was wondering if they have a big selection of vegetarian options / non-alcoholic drinks? Wish I had discovered this place when I lived in Birmingham.